Lex and Superman are engaged in battle. The Machinist watches from the sidelines, informing Superman that the mind-tick elicits the host's inner-most desire. Superman and Lex battle it out a bit more before Superman drags his opponent into space. Lex goes into his usual tirade of Superman being an alien. The Man of Steel notices that the Apokoliptian tech in Lex's battle suit is making Lex more like Darkseid (see the events of The Darkseid War). Superman is hit by kryptonite darts and plummets to earth. Lex flies after him and has his suit activate every feature that he built. 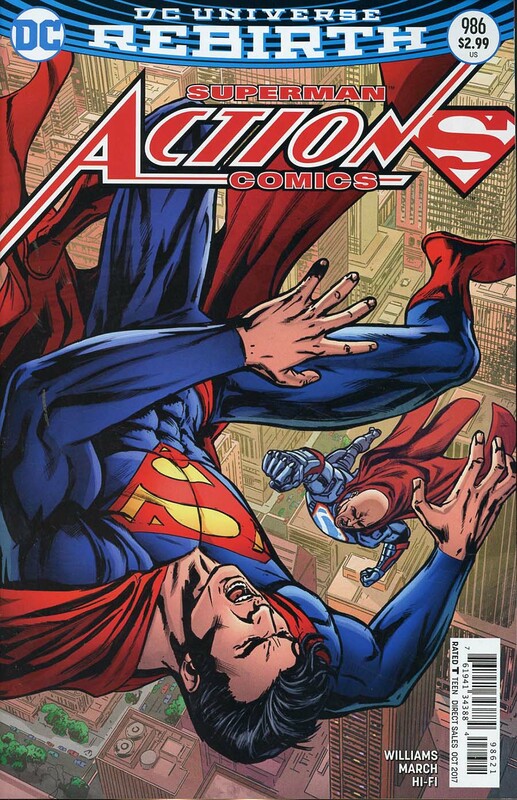 Before the two can hit the ground, Superman regains consciousness and prevents an impact. 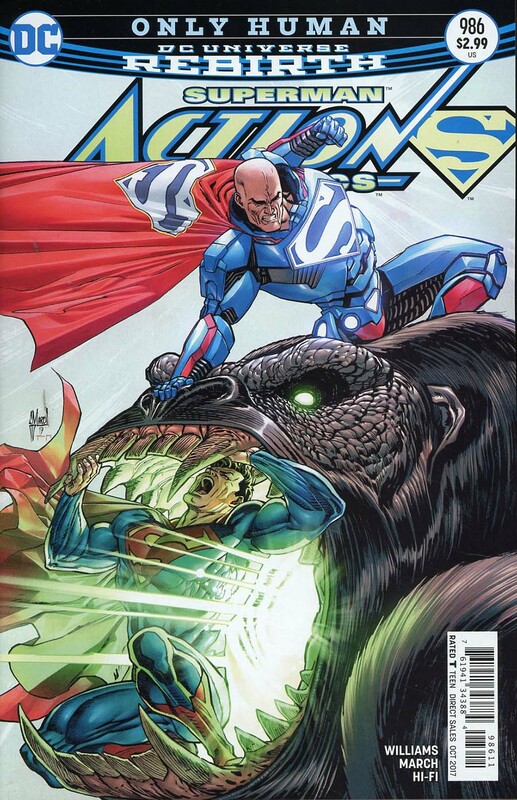 With Lex's suit out of commission, Superman is left to take on The Machinist's army alone. Before he can be captured, The Machinist makes an escape. After the fighting is done, Lex and Superman share a moment. Back at Lexcorp, Lex reviews the footage captured by his suit when he stumbles upon an odd symbol. As he begins to have his computers research it, Mr. Oz appears and has the image of the symbol erased. Oz reminds Lex that he isn't Superman and vanishes. Story - 5: Much like last issue, this book feels like a Superman story. Williams writes very well and this story arc reminds me a lot of something I would have read around 2006-2007. While I still don't particularly find The Machinist to be that interesting of a villain, Williams certainly did more for the character than Johns did. He actually feels like a threat now, albeit a minor one. Regarding Lex, I'm conflicted. On the one hand, I feel like he's making a genuine effort to be a hero. As a Superman fan, I should want Lex to be reformed. The belief that anyone can be a force for good is part of what draws me to Superman as a character. On the other hand, I want Lex to go back to being a villain. There's this weird gray area with Lex. I see the good in him, but I'm also keen to see his dark side. I guess time will tell. The last few pages of this issue have me excited to find out more about Mr. Oz. He's been built up over the past year and a half and it's about time we got some answers! Art - 4: For the most part, the art in this issue is perfect. Every now and then, there's a panel where things look a bit off. The action sequences are fantastic and make me wish I could see the events happen in real time. Cover Art - 3: The standard cover is fine. I don't know why Titano is on the cover, though. I suppose it does its job of interesting the potential buyer well enough. Variant Cover Art - 4: I much prefer this variant. The thick lines really make this piece for me. Everything is well drawn and the colors really pop. I kinda wish this was the standard cover. Also, I know this isn't really anything to do with the art, but I love the Action Comics logo being all in red. It just looks great that way.